Gator provides one of the most comprehensive standard chuck offerings on the market and can also handle all of your requests for SPECIAL or MODIFIED standard manual lathe chucks. Gator’s capabilities extend to both Independent and Self Centering Scroll chucks covering 2, 3, 4 and 6 jaw executions with chuck diameters ranging from 3” – 50”. Body material options include Cast Iron, Cast Steel, and Forged Steel. We can work with your prints or our engineering department can develop the drawings focusing on your special needs. Threading large diameter pipe where a larger thru-hole is required? Have an application that requires a closed thru-hole? 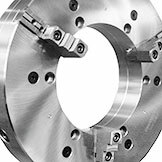 Many turning and milling applications demand chucks with non-standard thru-holes. 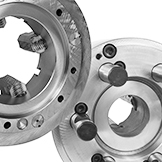 Gator can produce independent and scroll chucks with non-standard thru-holes in Cast Iron, Cast Steel and Forged Steel bodies for medium and heavy-duty applications. Today's turning and milling operations along with workpiece surface configurations many times require jaws that exceed standard jaw capabilities; applications requiring smooth or sharp serrations and/or special length, width and radius sizes can be produced and supplied with a Gator Chuck, or can be supplied as an add-on for a chuck you already have. 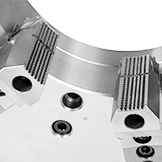 In some cases, milling and turning applications require additional clamping options to grip a workpiece properly and safely. 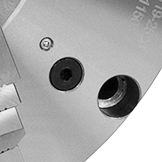 T-Slots milled on the face of a chuck can be used for such applications. Gator can provide T-Slots for chucks not typically produced with T-Slots, and can also produce chucks with custom or special T-Slot configurations. T-Slots can be supplied on Cast Iron, Cast Steel and Forged Steel body Scroll and Independent chucks for both medium and heavy-duty applications. More and more of today's machining applications require the delivery of coolant under high pressure which can wash out chuck lubrication: many applications also will require special lubrication options due to operations performed in "severe environments". Gator can produce standard or custom chucks with a variety of lubrication options. 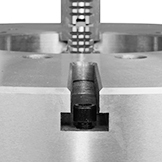 Beyond standard mounting options, Gator chucks can be produced for your special lathe, table, indexer, tailstock or fixture mounting requirements. We can supply your special mounting system as a direct mount option or we can supply special baseplates and adapters that will work with one of our plain back chucks.